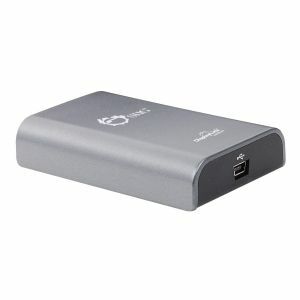 USB 2.0 to DVI/VGA Pro adapter is designed to quickly and easily add an additional display to your USB-enabled (USB 2.0 or later) computer. This USB to DVI/VGA adapter supports standard and wide screen monitors with resolutions of up to 1080p and WUXGA 1920 x 1200, multiple display modes including primary, extended, and mirrored, and Windows suspend and hibernation power management. The USB 2.0 to DVI/VGA Pro adapter is hot-pluggable and is powered from the USB bus, no external power adapter is needed. It is a perfect solution enabling you to extend your display across two screens or as an alternative display for your main screen. SIIG's USB 2.0 to DVI/VGA Pro adapter is powered by DisplayLink chip, conforms to USB specification, revision 2.0, is FCC and CE regulatory approved and RoHS compliant. It is fully compatible with a wide variety of Windows operating systems.